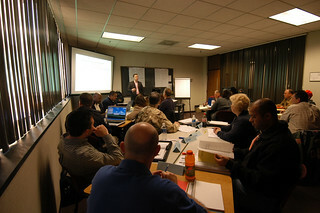 The Georgia Public Safety Training Center offers instructor certification training programs that allow public safety officials to become certified to train other personnel in their local jurisdictions. The courses provided through the instructor certification training programs are designed for public safety personnel who are responsible for instruction in performance-oriented training or who are responsible for developing lesson plans. Through the Instructional Services Division, GPSTC offers a General Instructor Training program as well as a Departmental Officer Training program, both of which qualify for POST certification. Senior and Master Instructor Certification The Instructional Services Division also manages GPSTC’s Senior and Master Instructor Training program. Once certified as a POST General Instructor, instructors may voluntarily pursue senior and master instructor trainer certification with POST through a series of teaching and evaluation sessions in the Instructor Training Course. Contact the Instructional Services Division for more information regarding Senior and Master Instructor Certification. Specialized instructor training programs are available through the respective Georgia Police and Georgia Fire Academies and qualify students for POST and/or NPQ certification as an instructor.